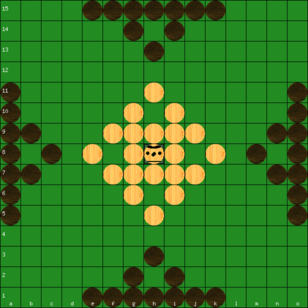 Strong players' influence on the calculation of Game Balance. 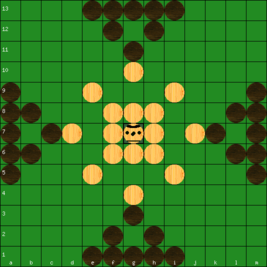 The game balance is calculated in such a way that strong players weight double as much in the result as non-strong players. On game balance in favour of attackers or defenders. If a game setup favours the attackers and another setup equally favours the defenders, are the two setups then to be considered equally well working, or is one to be preferred over the other? Playing attackers or defenders are two very different tasks. 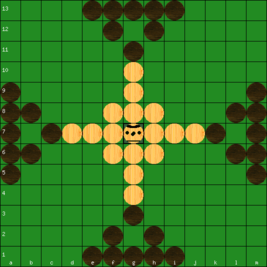 In a well balanced tafl game, the defending player usually is bound to play very aggressively, creatively and swift from start to end, all the time come up with plenty of good ideas for tactics and strategy, or else his side will soon be stuck in the swarm of attackers and lose. The defender is the player with the initiative. The attacking player, on the other hand, can very often make do with a reactive playing style, only shooting down all ideas and attempts of his opponent, and still win. Of course it'll help him, too, to be creative and inventive, and he'll win faster, but it's not a must. So, if one setup favours the defenders and another equally much favours the attackers, then I'd say that favouring the defenders is to be preferred. Because it's the defenders who must be creative, aggressive and inventive, and so they also should have a fair chance to be awarded for their efforts. The "Nielsen"-setups of tawlbwrdd 13x13 and 15x15 were tournament tested. They did not work so well as do the "David Parlett" 13x13 and "Damian Walker" 15x15 setups, but I think there is a lesson to be learnt from the experiment. The "Nielsen"-setups are nothing ingenious, they are just the simplest extensions to larger boards of the classic 11x11 setup (diamond-T). 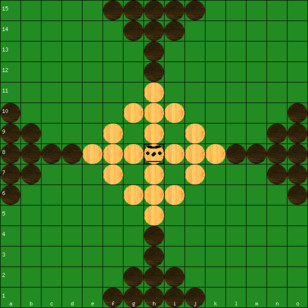 The tests, however, showed that on the larger boards the game is better balanced if the pieces initially are more scattered on the board, or the attackers more gathered in center of the edge.